Tap Tap Dash Online is an online game that you can play online for free. You tap, the bird jumps. Double tap, the bird turns direction in the air, then it can survive. 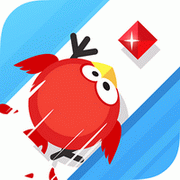 Tap tap dash online is such an addicting game, what you need to do is just tap to jump at the right time, the cute bird will live much longer. The arrows are tips for jump. The speed your bird running will be faster and faster as time goes by, so focus on the road, or your bird will crash and die. Try to create a new high score and show it to your friends, have a good time!